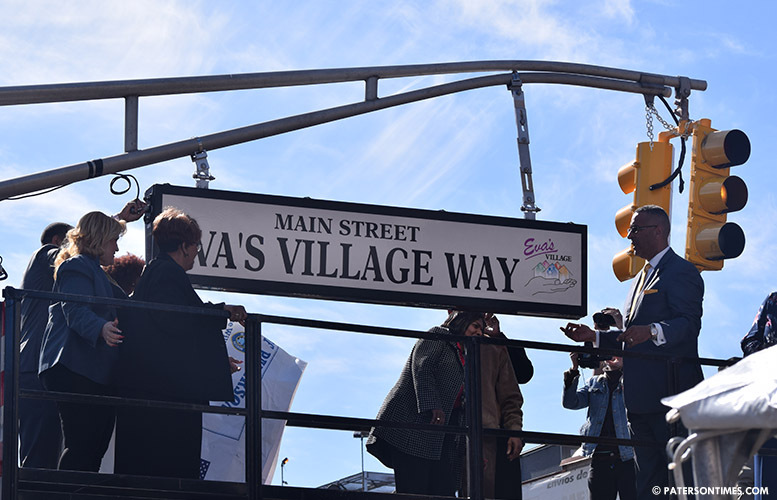 Municipal officials unveiled a large street sign on Saturday afternoon additionally naming a portion of Main Street in tribute to Eva’s Village for serving the city’s needy residents for more than three decades. Councilman Luis Velez and other officials climbed into the back of a truck at the intersection of Main and Grand Streets. The truck’s platform was raised up to intersection’s traffic light. He counted to three and pulled the covering off a new street sign that read, “Eva’s Village Way” to the cheers of few dozen people. “This is very meaningful for us,” said Mark Schmit, chief executive officer for Eva’s Village, who pointed out that it was in April 1982, the nonprofit organization, that has become New Jersey’s largest anti-poverty group, was founded in the basement of the Sisters of Charity convent at St. John’s Cathedral. Monsignor Vincent Puma fed 30 homeless people on that first day. “From 30 people fed, we now serve 300 every day of the year,” said Schmit. Eva’s Village served 522,543 meals in 2017. Mayor Jane Williams-Warren expressed her gratitude to Puma for starting the organization after seeing great need in the community. The organization which began as a simple soup kitchen has grown to run 20 programs to assist those in need helping them to move towards stability and independence through food, shelter, recovery, medical services, education, and job training. 2,289 people found a path to recovery through its treatment programs. Its primary medical and dental clinic handled 5,899 patient visits. 525 people suffering from opioid addiction were shown a pathway to recovery through its Opioid Overdose Recovery Program. 508 individuals received temporary or permanent shelter through the organization. 320 clients were provided assistance with resumes, interviews, and job searches in 2017. 93-percent of the nonprofit’s culinary school graduates landed food service jobs. The organization had an $11.62 million budget in 2017. Less than 7-percent of its expenditure was in administration. Velez was joined by councilwoman Maritza Davila. She co-sponsored the resolution along with councilman Kenneth Morris. She said when her father needed assistance, Eva’s Village was there. The organization is named after sister Eva Hernandez, who served as the first director of the kitchen. Hernandez, a Missionary Sister of the Immaculate Conception, came forward to help with the project after hearing a plea from the pulpit in a local church. Both her mother and father were cooks. Her brothers were in the restaurant business. She had experience organizing food and housing assistance for migrants in her native Texas. Hernandez’s skills were what the kitchen needed to thrive.